After the short window of good flying closed behind Reaper and Frank at Koko Crater yesterday, over a dozen eager pilots rushed over to Lanikai to try their luck at the east bowl. Nine pilots flew in conditions that started a bit brisk but steadily improved to just about perfect. It was great to fly and party with so many of you on my first day back from the cold and dreary east coast. When we first arrived at Lanikai, Jim and I checked the beach LZ conditions and found them just about perfect, 8 or 9 mph by our guess, straight down the beach. Berndt led the charge up the hill, followed by me, Jim, Scrappy, Ginny, Thom, Maile, Don, Harris, and Joey. Don's neck had been bothering him since the day before, but apparently there's nothing to cure a sore neck like the promise of sweet east bowl conditions. Meanwhile, Reaper arrived at the LZ with Rich and started freaking us out with radio reports that the wind was too strong down at the beach, measuring gusts up to 15 with Rich's wind meter. He also said Bellows was showing 16 (I later realized he was referring to the gust speed - the average was only 10). But the conditions certainly didn't seem that strong at the top of the hill - and the Kailua sensor was still averaging 9 at 75 degrees, which is just about ideal. After a while Reaper said he'd come up and check it out. I launched first, shooting straight up in conditions that seemed a little on the brisk side, but over the course of the afternoon they eased back to perfect mellow speeds. We flew all around the east bowl, from the bunkers to the tip of the ridge out by Bellows beach. There were some nice thermals pumping off the spur, which took us up to almost 1,200 feet at times. There were seven wings in the air at one point, which definitely kept us on our toes at a small site like Lanikai. We couldn't get away with a crowd like that on a typical light north bowl day, where we often have to play musical chairs to fight it out for four or five slots. It was really great to see Berndt out there enjoying a nice long flight, the second since his extended hiatus from paragliding - way to go, Berndt! Joey had just bought McStalker's new extra wing from him at Sandys, and was excited to give it a try. It is a U-Turn Free Force 22 (same as Jetflap's), in red, white and blue Richard Gallon colors - a very nice looking wing. Jim hooked in properly and flew facing forwards, to everyone's disappointment. In fact, everyone pulled off really boring textbook launches and landings, a rare feat for a weekend day at Lanikai. What's the world coming to? Harris was there for his first Lanikai flight, and showed us again what a talented new pilot he is. Nice flying, Harris. Scrappy finally roped Reaper into another student tandem flight, bringing him one flight closer to the awesome responsibility he has craved for so long. Way to chase him down, Scrap. Thom was excited to go for his second high flight, but he ended up heeding Reaper's advice to wait for easier launch conditions, and hiked down, along with Ginny. I sure wished I could have been there for his first flight Friday at Koko. I know I'll be flying with him soon though! Dorothy sent me several text messages during my flight, to ask when I was coming home, and to say how much she was missing me. Doh! I texted back that I would aim to be home by six, and after another half hour in the air I finally forced myself to head out for a landing. 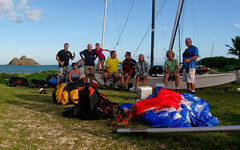 Just before the first shift of nine pilots all headed in to land, Hilo Ken hiked up and begain to set up for his launch. Mad Dog and Jeanine and Donna met us all at the LZ for a nice party at the Catamaran LZ that continued til sunset. Thanks to Rich for the delicious cold beverage. Ken finally got off the hill with Nightshift's help, descending after a short flight for the last landing of the day, right in front of the party. I rushed out of there a bit later than I should have, but I ended up just making it home at six. What a great first day back. Let's do that again soon! Check Reaper's Flickr page for his pictures and videos. If anyone else has any to share, let me know and I'll link them here.